When eighteen-year-old Abby Goodwin finds Jefferson Andrews, the town's golden boy with some darker secrets underneath his perfect facade, dead in a ravine while on her morning run, and her sister Maya's phone not far from his body, she knows that the situation looks grim, but she also knows Maya wouldn't have killed anyone. Used to protecting Maya her entire life, Abby knows she must get Maya out of town and throw the attention away from her. But protecting Maya from a possible murder charge isn't the same as protecting her from nasty gossip or making excuses for her consistenty bad behavior to their parents. Keeping the police off of Maya's tail (and her own) will prove harder than Abby originally thought, and then of course the most important question still lingers: who really killed Jefferson Andrews? 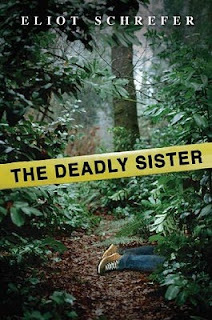 The Deadly Sister is a fascinating examination of sisterhood, loyalty, and how far one person will go to cover up a vicious crime. Abby is a hard character to make out though: it's obvious to the reader that she is fiercely loyal to her sister in all that she does to protect her, but the reader doesn't get into her feelings and motivations toward Maya until the end of the book, and by then many readers may have already dropped The Deadly Sister in confusion. Similarly, the true feelings of Abby and Maya's parents may befuddle readers. They're lawyers and seem to be truly invested in doing the right thing, but oftentimes say or do things that go against their characters that only confuse the reader and aren't really explained in the end. However, Schrefer's novel is certainly intriguing and convoluted as Abby peels back the layers of Jefferson's life and discovers secrets pertaining to him all around her. There is no shortage of leads, clues, and suspects, and with each new chapter, readers will have a new theory. However, the more astute reader will easily pick up on the clues pointing to the real killer, and many will guess who the killer is long before the reveal, which lessens the drama, and leaves only one question left: will the killer get away with it? Though interesting and multi-faceted, The Deadly Sister just doesn't pack as much punch as other YA thrillers out there, such as Anna Jarzab’s All Unquiet Things. Cover Comments: This cover certainly grabs your attention! I like it a lot, and how the yellow tape in incorporated into the title display. It also seems morbidly fitting seeing as the scene depicted is similar to the setting in which Abby finds Jefferson's body, though the brightness of the colors make it seem less serious somehow. I really enjoyed this book, but it was a little slow from time to time. I loved the ending!